Take part in the 2017 5 & 10k run Challenge to raise money for Overgate Hospice. This entry was posted in Apr, Get Involved / Have Your Say and tagged calderdale, Event, Fundraising, Get Involved, Halifax, Holmfield, Overgate Hospice, Running. Get involved with the Overgate Hospice Spring/Summer Fashion Show 2017 and arrive early to shop before the show. This entry was posted in Get Involved / Have Your Say, Mar and tagged Event, fashion show, Fundraising, Get Involved, Halifax, March, MBI Shay Stadium, Overgate Hospice. Dust off those boots and enter a team into a 5-a-side tournament to raise money for Overgate Hospice. This entry was posted in Apr, Get Involved / Have Your Say and tagged Event, Football, Fundraising, Get Involved, Halifax, Overgate Hospice, Shaw Lodge Mill, sport. The course is aimed at workers, volunteers and management committee members of community and voluntary groups who are involved in (or hoping to contribute to) their organisation’s fundraising efforts. The workshop is open to people wanting to increase their confidence and success with funding bids. The emphasis is on group work and the atmosphere will be informal. This entry was posted in Feb, Get Involved / Have Your Say and tagged calderdale, February, Fundraising, Get Involved, Halifax, Training, VAC, VAC Resource Centre. 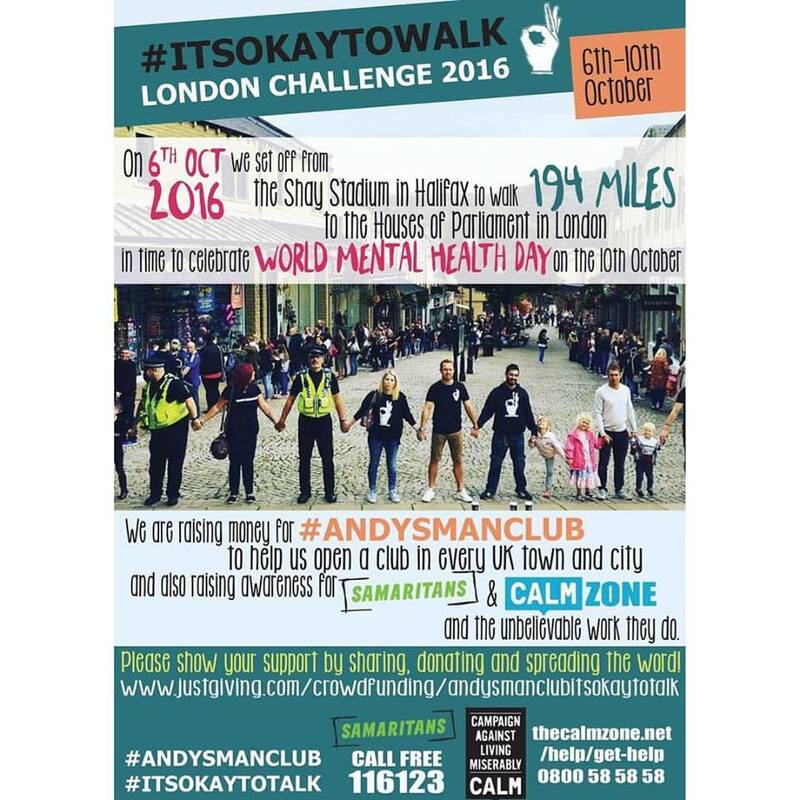 Show your support and donate to a great cause ‘London Challenge 2016’ which is raising money for #ANDYSMANCLUB in order to help open a club in every UK town and city and also raise awareness of the unbelievable work of Samaritans and Calm Zone. A 194 mile walk from the Shay Stadium, Halifax to the Houses of Parliament in London will begin on Thursday 6 October in time to celebrate World Mental Health Day on Monday 10 October. Show your support by sharing, donating and spreading the word! Please visit www.justgiving.com/crowdfunding/andysmanclubitsokaytotalk if you would like to make a donation for this great cause no matter how big or small! This entry was posted in Brighouse, Elland, Get Involved / Have Your Say, Greetland & Stainland, Hipperholme & Lightcliffe, Oct, Rastrick and tagged andysmanclub, calderdale, Calm Zone, Event, Fundraising, Fundraising Event, Get Involved, Just Giving, Mental Health, October, Samaritans, Shay Stadium, World Mental Health Day. Get involved with a 13 or 6 mile midnight walk and support Overgate Hospice this weekend. This entry was posted in Get Involved / Have Your Say, Sep and tagged calderdale, Event, Fundraising, Fundraising Event, Get Involved, Go Walking, Halifax, Health, Midnight Walk, North Bridge Leisure Centre, Overgate Hospice, September, walking. Art can be a way to express yourself and work through difficult emotions or experiences and this exhibition is to inspire people from all walks of life. This entry was posted in Aug, Get Involved / Have Your Say, Oct, Sep and tagged calderdale, Donate, Event, Fundraising, Get Involved, Halifax, Healthy Minds, Mindspace, October, September, Sowerby Bridge, Voluntery Action Calderdale. Storm Trooper Zumbathon – Next week! Raise money for Calderdale flood victims at the Storm Trooper Zumbathon. Whether you’re a newbie or a pro this event is open to everyone with a guest appearence by Lizzie Jones, cakes, face painting and more. Get involved for just £10 per person or £5 for under 12’s. If you would like to take part or would like further information find Storm Troopers Zumbathon on Facebook. This entry was posted in Get Involved / Have Your Say and tagged Calderdale College, Event, February, Fitness, Fundraising, Get Involved, Inspire Centre, Zumbathon.